My relative Eliyahu Goldenberg was a Yiddish and Hebrew actor. Eliyahu, son of Michel Goldenberg and Edith/Yehudit Fishman, was my father's first cousin. He was born in an agricultural village, which later became a kolhotz, Sosnivka, Ukraine, on Sept. 9, 1909. His mother died when Eliyahu was less than two years old. The family later moved to Belozerka, which he referred to henceforth as his home town. Both Sosnivka and Belozerka are near Kremenets. From the age of eleven, Eliyahu was apprenticed to a grave carver, and he became independent. At the age of fourteen or fifteen, Eliyahu arrived in Krakow, where we have an account of him living in a clubhouse, and paying for his food by giving Hebrew lessons. He was known there as "Belozorker". Although he left home at a very early age, he remained a loyal son of his father in Belozerka. After his five siblings immigrated to Argentina and the United States, Eliyahu continued to visit and support Michel until his death in 1934. Although Eliyahu had very little formal education, he became a self-taught and learned man. 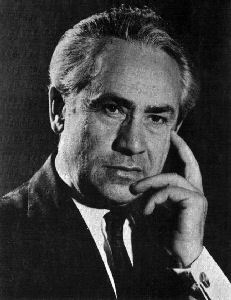 From Krakow he moved to Warsaw, where he both acted in theater and taught drama, before coming to Israel in about 1938. In late 1937, he met his future wife, Lili Folman, who was one of his students in a high school Hanukah play about Eretz Israel which he had written and directed. He later succeeded in a desperate attempt to remove Lili from the clutches of the Nazis; she became the last person to leave Warsaw by permission of the Gestapo. During World War II, Eliyahu was the director of the Palestine British Army entertainment group. Professionally Eliyahu mostly presented dramatic readings of classical Yiddish writers, including Shalom Aleichem, usually with two other actors. (This form of drama is no longer seen.) He also read these writers' works in translation to English and Hebrew. In his readings, he would often act out several roles, injecting them with a good measure of humor. His best-known program was entitled Die Kleine Menshalach (The Little People), in which he appeared with actors Shmuel Rudensky and Shmuel Segal. In the early 1950s Eliyahu also worked in London, England, for a couple of years. In 1960 the flag of Israel flew at the Edinburgh Festival for the first time, with The Little People, directed by Eliyahu, and with himself, Rudensky and Segal as actors. Later Eliyahu directed and acted in dramatic readings in Cincinnati and Cleveland, Ohio, where I first met him, in the winter of 1967-8. Several well-known Israelis were among his students of dramatic and radio reading. He appeared before many schools in Israel, gratis, and especially liked working with young people. He was very well known in Israel in his own right. Later he became known by many as the father of Dudu Topaz, a popular Israeli entertainer. A second son, Michael, is a producer and author. Eliyahu told me that he was a distant cousin of Edward G. Robinson (Emanuel Goldenberg), but we don't know the connection. Eliyahu was also an ardent Zionist, and spent many hours in a moshav in the north of Israel inhabited by families from Morocco. His goal was to help them to help themselves. When I first went to Israel (encouraged by Eliyahu), in February 1968, with two friends, Eliyahu and Lili hosted the three of us for a month in their home. Eliyahu died on November 4, 1976.